My wife and I bought a used car last fall. Not an old junker either — it was a single owner Mitsubishi Outlander with 60,000 km. Aside from a bit of lag on acceleration due to the CVT transmission, it’s a pretty nice vehicle to drive. Being a few years old, the full service warranty had just expired but the powertrain warranty was still intact. Vickar Mitsubishi was happy to provide us with a CarProof report showing that the car was regularly serviced at the dealership, right from the date of purchase. It also showed a few minor warranty repairs and two small damage repairs on the left rear of the car. Both occurred over 3 years earlier, and the damage estimates were small — equivalent to fixing a cracked bumper or some such thing. It didn’t seem like much to worry about, but we were concerned enough that we asked lots of questions about the history of the car, why it was traded in, and so on. It was more the minor warranty repairs that concerned me, although it’s not uncommon for a car to get a squeak or a rattle. “The previous owners were very picky” we were reassured. “They wanted to take advantage of the full service warranty to fix every little thing they noticed.” (I’m paraphrasing from memory, but that was the gist.) We were told that they probably traded it in simply because the full service warranty had expired and they wanted a new car. Still it was comforting to know that the CarProof report was so comprehensive, showing every service done on the car right from the start. That’s the advantage of buying a car that was purchased, serviced, and traded in at the same dealer: they can report everything to CarProof to show a comprehensive history of the vehicle. 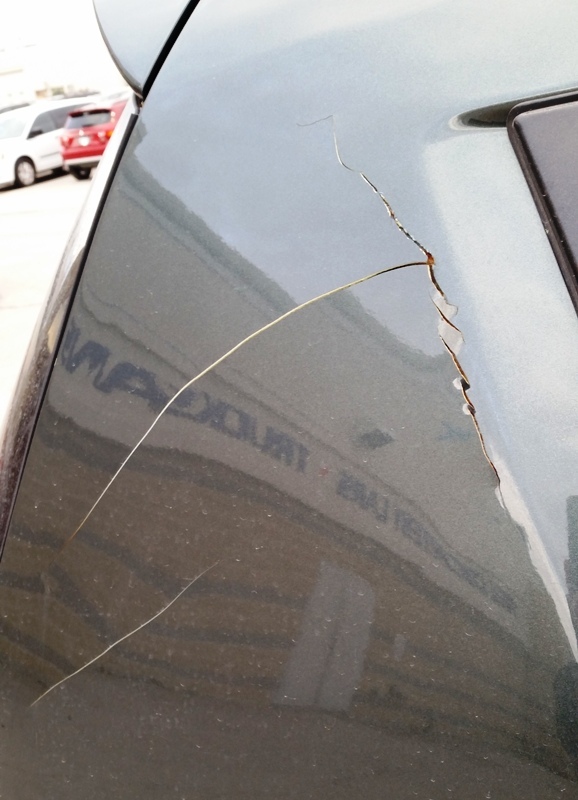 About a month after we bought the car, two cracks appeared on the right rear quarter panel of the car. They looked like scratches at first. Odd, I thought, that I wouldn’t have noticed those on my inspection of the car when we bought it. I had Vickar fix any minor blemishes that I could see. I wanted a car that LOOKED NEW. A month later, the cracks appeared more pronounced. Now I began to wonder if something was up. Is there stress on the frame causing the cracks to appear? Are they the result of a faulty previous repair? I checked the CarProof report again, and confirmed that only minor repairs on the left rear of the car were shown, and those were from several years ago. There was no damage to the right rear, and nothing recent that could explain these cracks appearing. The cracks got progressively worse over the winter, to the point where they began to open up, exposing the metal beneath. New vertical cracks started to appear too. This was getting bad. What the hell was happening to our car? I brought the car into Vickar Mitsubishi and I asked for the Sales Manager. I told him what happened, and showed him the damage. He appeared pretty shocked at the damage, but when I asked that his dealership pay for the repair, his shock turned to indifference and then defiance. It was pretty clear that just showing up at the dealership was not going to get me anywhere, so I headed to Vickar Autobody & Glass. The Vickar dealerships perform mechanical repairs, but they do not do body work and collision repairs. It is Vickar Autobody & Glass that does those things for the Vickar cluster of dealerships. If the problem was a result of a previous repair, it should be in their records because everything that was done to this car was done by Vickar. 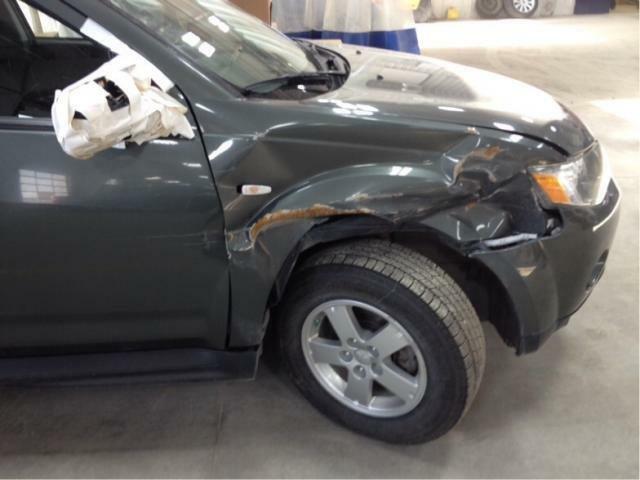 To their credit, the folks at Vickar Autobody & Glass agreed to pull up the repair history of the car. Sure enough, the quarter panel in question had been repaired in 2014, and because the cracks were a likely result of the previous repair, the Service Manager agreed to repair the rear quarter panel at no cost to me. That was a big relief, but the story doesn’t end there. The search also turned up another unreported collision repair, and not something minor either. There was significant damage to the right front of the car. As you can see from the rust on the crumpled body panel, this damage had occurred some time prior to these photos being taken. I am quite certain that the previous owners were driving it like this for a while before trading it in to Vickar Mitsubishi. That doesn’t really matter though. The point is that Vickar must have been aware of this damage. This is extremely disappointing. Damage like this is obviously very relevant information, and would have been a factor in our decision to buy the car, or at the very least in the price we would pay for it. In fact, I can just about guarantee that we would not have bought this vehicle regardless of the price. Vickar Autobody & Glass provided us with a courtesy car while it was getting fixed, and they ended up replacing the entire rear quarter panel so there should be no issues with this in the future. I don’t know what happened with the original repair, but I have no complaints with how Lindsay and the folks at Vickar Autobody & Glass handled this followup. I emailed the Vickar Mitsubishi Sales Manager/Vice President, Daniel. Hey, remember me? They guy with the cracks? Ya well it turns out there was also massive front end damage you didn’t tell us about. I also mentioned that I might possibly write about this episode on my blog. If he knew how obscure my blog was he probably wouldn’t have worried about it, but I wanted to make sure my issues were taken seriously. Daniel phoned, much more concerned and apologetic than the during our first meeting. He was going to get the CarProof report updated, and better yet: he was going to offer compensation. So far so good. The updated CarProof report came within days. This tells us one thing: the missing repair on the original report was not due to a timing issue. They can update the report pretty quickly when they want to. Anyhow, there was indeed a new repair on the updated report. In fact, there were two: “right rear corner” valued at $5,004, and “Rear center” valued at $1,489. That is $6,500 in damage that was unreported the first time. Then came the offer of compensation: $500 ……. in service credits with Vickar Mitsubishi. We rejected the offer. It is difficult to pinpoint how preexisting damage affects the value of a used car, but a credit for a service garage is clearly insufficient. I do not believe this was an offer made in good faith. I think it was a low ball offer to see if they could wipe their hands of this problem without having to cut a cheque. When I rejected the offer, Daniel put the ball back in my court. What did I want for compensation? I would like to clarify something before I go any further in the discussion about compensation for the previous damage. The updated car proof report shows $5000 for a “Right rear corner” collision. I assume this is the repair that required the right rear quarter panel to be fixed — the repair that ultimately failed, causing the cracks in our car to appear. However the photos that I was sent show severe damage to the right FRONT of the car: a badly damaged right front quarter panel, smashed side mirror, some damage to the door and only minor damage to the lower rear end of the car. There is an additional item on the report called “Collision – Rear centre”. This does not describe a right quarter panel repair to the side of the car either. I know that there were at least 2 repairs: the one that required the right rear quarter panel to be fixed (the repair that resulted in the cracks forming) and one that required the front end damage to be fixed, and I’m having difficulty aligning these with the descriptions on the report. This leads me to suspect there may have been three repairs: right front, right rear, and rear centre. To clear up this confusion and to help me understand what exactly happened to this car, could you provide us with a list of the operations performed & part replaced on each of the repairs? It would really help. The response: “The Carproof report did not correctly describe the damage and did not pull all the info into the report“. I was sent the repair detail as requested, and it included front-end and rear-end repairs, and had a new total: $8,330 plus tax. I’m not actually going to tell you what I asked for in compensation, but I can assure you it was more than $500. In addition to cash, I asked for an additional year of their new car Diamond Care warranty just for a little extra protection against other things that might go wrong with the car. There was some foot dragging by Vickar as they attempted to get CarProof to pay for some of our compensation, but I pointed out to Daniel that their negotiations with CarProof have no bearing on what I’m entitled to for compensation. The fact remains that Vickar sold us a car that was nearly written off without disclosing the damage. We would not have bought the car had we known. 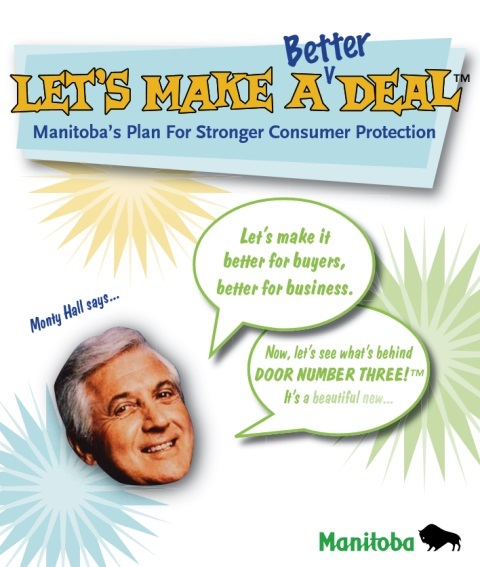 Vickar was in violation of Manitoba’s consumer protection laws and was responsible for making this right. About the Consumer Protection laws: it was a pain to find anything about used cars. After a bit of emailing, a government worker sent me the link to the act (link) which stated that disclosure was required “if the motor vehicle has been damaged and the cost of repairs to fix the damage caused to the motor vehicle by an incident exceeded $3,000.” However, you will not find anything about this on the government’s Consumer Protection web page, or in their Let’s Make A (Better) Deal consumer protection guide. And by the way: if you work for the government and are tempted to design a document around a pop culture reference, don’t. Just don’t. Please. This is real. This is not something I made up. Anyhow, the good news is Vickar relented and gave us exactly what we asked for in compensation. You could call this a happy ending if you want to, but the question was never answered: why was this information not disclosed? 1) Why was the information missing from the CarProof report? 2) Why was it not verbally disclosed by the sales team — and we spoke to more than one person — before we bought the car? About this last one: I used to work in a store that sold bikes, and when a bike was returned and repaired for sale, all of the sales staff knew about it. And these are bicycles I’m talking about, not motor vehicles. I obviously have no way of proving that they intentionally hid this information from me but I find it difficult to believe that they didn’t know, and if they really didn’t know, that does not speak well of their knowledge of their used car inventory. With respect to our reports and the damages information that we provide, this is information received from insurance companies and not private garages such as dealerships etc. Unfortunately when an individual pays out of pocket for damages and there are no police reports for an accident, there is no way to track said information unless a dealer voluntarily provides such information to his customer. However these repairs were reported to MPI. I know this because I obtained the vehicle history search records from MPI. If MPI knew about this in June of 2014 then CarProof should have as well. Somebody dropped the ball in the exchange of information between the two. My advice after all this? You can get your CarProof report and read it, but just be aware that it may be missing information or that information on the report might be incorrect. Also, if your vehicle is from Manitoba, request the “estimate sheets” from MPI (call 204-985-7000). So that’s that. A year after we bought the vehicle, the saga is over. It looks good again, and we can close our eyes and pretend that it’s the car we thought it was when we first purchased it. Keep in kind Mr Vickar is well connected to the government in relation to advising on legislation about vehicles as well as a member of the board of Manitoba Hydro. I did not know that. Maybe that’s why they don’t publicize the protections!